The Mai-Kai offers a wide variety of arrangements for groups, from an intimate cocktail reception, to luncheons and dinners, and dinner & show parties. If you prefer to celebrate at your choice of location, our catering department will bring all you need for a tropical feast: food, tropical drinks, décor and entertainment! The roaring drums sound the beginning of the exciting islander revue. You will be enticed by the romantic Hawaiian wedding dance and the thrilling Samoan fire knife dance performed by our native Polynesian dancers. Let us sweep you off your feet with our great service, exquisite cuisine and entertainment second to none. We welcome groups up to 300 to enjoy our dinner and show packages, for a true evening to be remembered. We also offer packages for elegant dining without the show. Please ask our Banquet Coordinator for details. The Private Cocktail Party is a package that includes an unlimited amount of our famous appetizers and a full open bar. The Cocktail Party can be held in our Molokai Lounge, Samoa Room or our Tahiti Room overlooking our beautiful gardens. On a beautiful buffet, decorated with tiki statues, fresh fruits and orchids, we will serve an assortment of appetizers to include your choice of 10. Please see attached PDF for menu options. The Mai-Kai main showroom is available for luncheon parties from 50 up to 300 guests. The main stage can be utilized during your function for DJ’s, guest speakers, presentations, fashion shows and of course our Polynesian Islander’s Revue. Each room throughout the Mai-Kai is named after a different island in the South Pacific, such as New Guinea, Hawaii, Moorea and Tonga. All of the rooms are decorated with museum quality artifacts and Pacific Island decor. Our beautiful gardens feature waterfalls, lagoons and giant tikis, which provide a unique and romantic background for pictures of any occasion. Daytime luncheons and receptions must be completed by 3:00pm or 4:00pm, depending on the date you choose. Luncheon prices start at $30.00 per person and include a complete meal with salad, entrée and dessert. You have the option of upgrading your appetizers and desserts, as well as adding entrées at an additional charge. Luncheons may be either sit down or buffet style. Please see attached PDF for menu options. The Tahiti and Samoa rooms, are beautifully decorated with artifacts from the Polynesian Islands. The Tahiti room seats 60 and the Samoa room seats 40. The Tahiti and Samoa rooms can be combined for one party up to 100 guests. 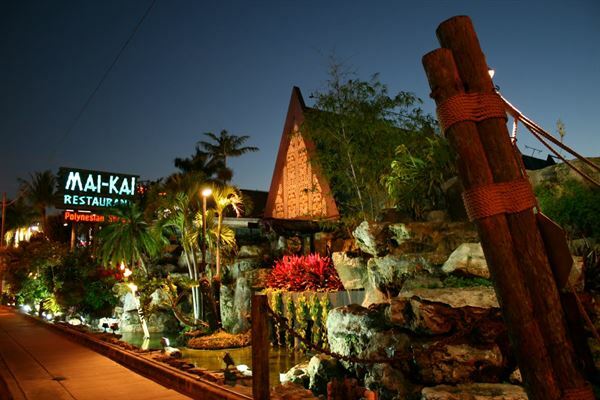 We can provide taped Polynesian music at no charge, or our musicians will sing soft Island music during the evening. The charge for the musicians is $175.00 per hour (minimum 2 hours). We can also perform a 15 minute “mini-show” with several numbers from our Mai-Kai Islander Revue. The cost is $500.00 and is performed by 2 female dancers, 1 male dancer and 3 musicians. Please see attached PDF for menu options. The roaring drums sound the beginning of the exciting islander revue. You will be enticed by the romantic Hawaiian wedding dance and the thrilling Samoan fire knife dance performed by our native Polynesian dancers. Let us sweep you off your feet with our great service, exquisite cuisine and entertainment second to none. We welcome groups up to 300 to enjoy our dinner and show packages, for a true evening to be remembered. Please see attached PDF for menu options. Please see attached PDFs for additional information and menu options.